Craft breweries are opening up all across the US and craft beer consumers couldn’t be happier. We’ve now exceeded the number of craft breweries in operation prior to Prohibition and according to the Brewers Association there are more breweries operating now than at any time since the 1870s. Most of these breweries are locally owned and operated and in many cases, the breweries use local ingredients – thereby spreading the benefits of the craft beer renaissance to their communities. While the loyalty of local businesses and communities to locally produced goods is no surprise, trends in the tourism industry indicate that tourists are beginning to seek a stronger connection to the communities that they visit. It’s no longer good enough to merely see the sights and hit the standard tourist destinations. People really want to be immersed in the community – they want to eat local cuisine, drink local beer, and get to know the artisans making the products they’re interested in purchasing. Given this shift towards something economists call the “Experience Economy”, the craft brewing industry is poised to reap the benefits of an accelerated appreciation for locally crafted goods. We’re witnessing what I like to call the Rise of the Brewery Tourist. What is a Brewery Tourist you ask? Unbeknownst to you… you may already be one. Above all, the Brewery Tourist has an interest in craft beer. Some Brewery Tourists have studied the history of beer and its role in our society – scholars, if you will, of beer. The Brewery Tourist may be an avid home brewer with an extensive knowledge of the brewing process while some may know very little about the history of craft brewing or even how beer is made. What matters most is a desire to be entertained, an eagerness to learn (or taste!) something new, and a goal of being immersed in the local craft beer scene. Brewery Tourists want to visit the local breweries and go behind-the-scenes. They want to meet the great people making the delicious concoctions of malt, hops, yeast, and water. For the refined Brewery Tourist pallet, it’s an experience of a beer’s regional nuance that is most satisfying. Whatever the ultimate motivations for seeking out a craft beer experience, the craft beer scene is exploding and brewery-related businesses are springing up in response. Our company, The Duluth Experience, is one example. With a mission of connecting tourists to locally crafted goods and a connection to the local craft beer scene, our project seeks to implement the Experience Economy to the benefit of our local community. 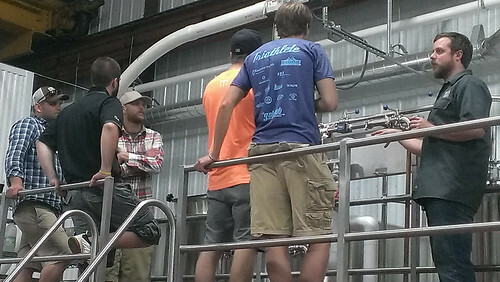 Companies like The Duluth Experience provide Brewery Tourists with fun and educational experiences by immersing them in the cultural and natural history of the region, recounting the history of beer, and educating them about how beer is made. They go behind-the-scenes so they can meet the brewers, explore the breweries, and sample their latest creations. The breweries and locally owned restaurants visited and the stories told along the way, give the Brewery Tourists a real sense of place, help to reaffirm the identity of the local communities… and they have a heck of a lot of fun along the way. The craft beer scene is likely to continue in its expansion and with it we expect to see continued growth of the craft beer Experience Economy. This niche market is an important part of the overall tourism portfolio of a community and businesses like The Duluth Experience will be important promoters of the local economy moving forward. The Experience Economy approach to conducting business will help connect tourists to the products and services they consume in a different way. The result is an informed consumer with a more complete understanding of the processes and people creating their favorite stuff. The tourism industry’s role is to expand the reach of our local companies to visitors from other communities so that they can be spokespeople in new markets. So cheers! Visit your local brewery and get to know your local brewers. If you’re interested in learning more about the North Shore Craft Beer Scene, please visit our Brewery Tour Page and book a brewery tour with The Duluth Experience!